Well tassels for flags that is. 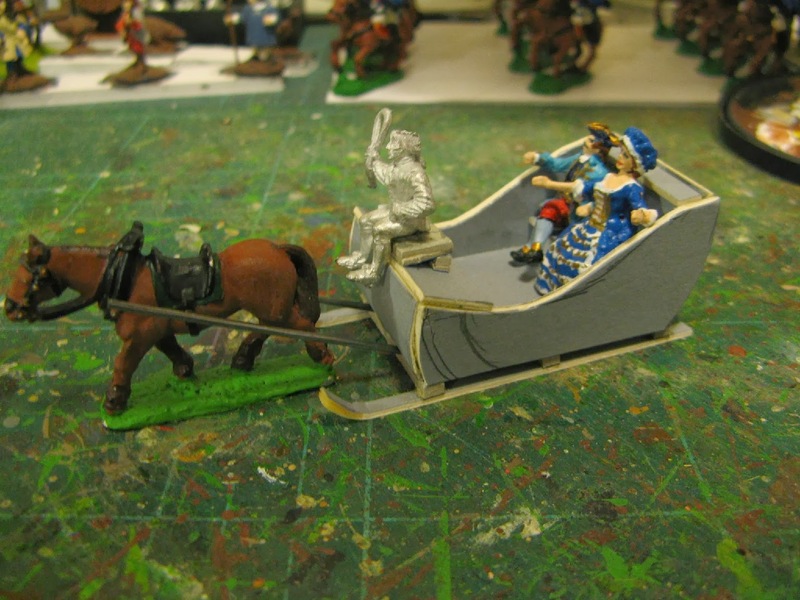 The last of the reworked units for the Monrovian army, these hussars sport a unifrom in the style of the Hesse Kassel SYW Hussaren-korps uniform. still needs work doing to it to provide some more detail etc then it can be painted ready for a run on the snow (I'm building up some winter scenics - white blanket and some fir trees with a dusting of snow). Three more units reworked for the Monrovian army, basically complete re-paints apart from the horses, these all sporting Hesse Kassel SYW style uniforms. Nearing the end of my work on the Monrovian army, with two units left to do; a hussar unit to re-paint and a brand new lead for the Garde de Corps. Artillery - complete repaint of crew and cannon. Prinz Wilhelm (at the back), cuffs changed to white and new flags. 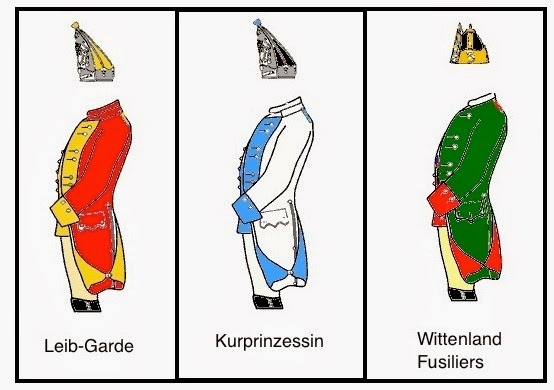 (Source of HK WSS uniform info taken from Wilkes Brigade at Blenheim and d'Herleville's Brigade at Blenheim ). von Wurmb, historically a militia unit (at the front), The figures used have also had the cuffs and pom-pom changed from red to yellow ochre. This is the last of the initial group of posts on the Monrovian Army - more to follow but I have quite a bit of rework/repainting to do on the rest of the units. Next post will be the Friekorps. 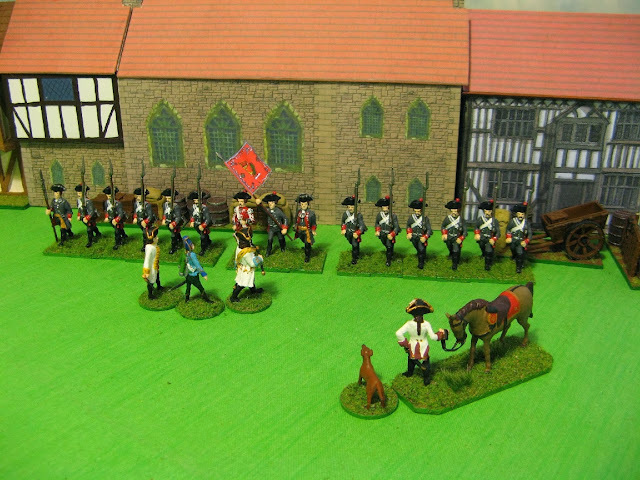 Onto the cavalry, four regiments upgraded with new flags; a little touch-in also needed for some figures. These were already painted as Hesse-Kassel units. By the time of the SYW the Kurassiers no longer wore the cuirass . 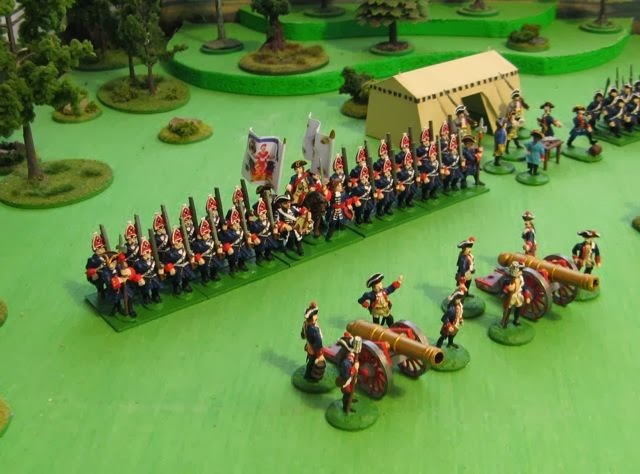 I have two regiments of cavalry to re-paint as Kuriassier and a new regiment to paint as the Garde De Corps . As the work on the Monrovian army has begun (see the previous post) - so the first of the posts on the Monrovian Army, this one is for allied contingents and foreign volunteers. 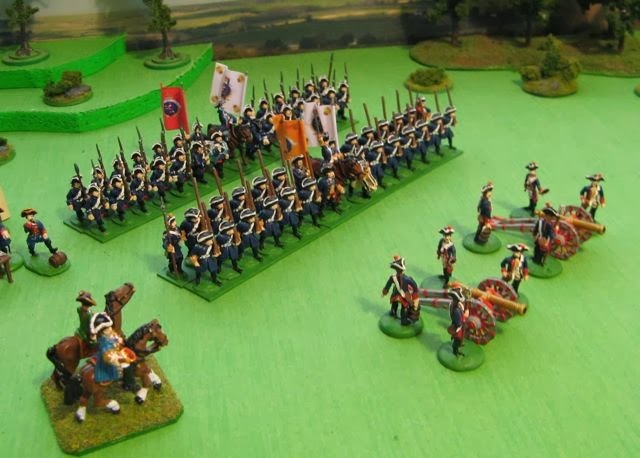 All units are unchanged apart from the battalion from Munkasse which has had some headgear swaps (half the battlion - new tricorne heads to replace grenadier heads) and new flags (using some for a Wurtemburg infantry regiment). I'll swap some figures around on bases to mix the swapped head chaps amongst the rest. 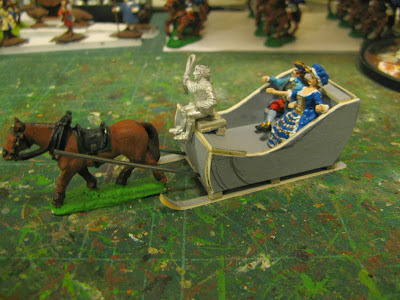 I'm going to try and get back to my original plan for the Monrovian Army - it will be based on that of Hesse-Kassel. The cavalry will be to SYW pattern unform, with the infantry a mix of SYW pattern uniforms and WSS uniforms (so I'll be re-using as many of my current figures as possible). The King is wearing his new swivel gun hat today, the members of the court had politely commented how marvellous it was. Just as he was about to open it, Count Hermann entered the library. The King turned quickly (the barrel of his hat gun swivelled jauntily to the rear). King: Hello Count, what do you want ? King: Ah of course, I must have a look at this book for a while. The King and the Count perused the book and agreed it was excellent, beautifully illustrated with many plates and line drawings. After a short while they left the library to go and see the Field Marshall. the Irregulars get some muskets..
Mlle Givenchy after a chat with Captain Scharfe has managed to obtain some muskets for her irregulars. we'll see how they get on the next time they are on a 'mission'. Mlle Givenchy: Yes, I'm much better today. We hope to go the capital tommorow, just waiting to see if my cousin will be able to travel. Monrovians under the guise of brigands, led by Captain Sennari of the monrovian army (who calls his motley crew Sennari's Marauders) have tracked down Count Balderdash who is under guard at Villa Rondiso, near Kirkhof in Wittenberg, they are intent on capturing him and returning him for trial in Monrovia. 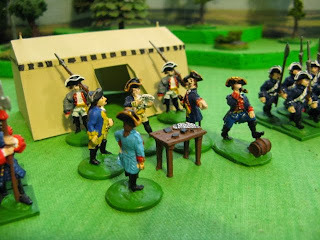 Captain Sennari and his Marauders took Count Balderdash with them and made it back across the border into Monrovia. Two of the Madame Givenchy's Irregulars were killed and the wounded were taken to Kirkhof where they were tended to, the waters from the healing spring near the church of St Barnabas were used to speed their recovery.